Drinking two 8-ounce glasses of water before breakfast, lunch, and dinner while also cutting back on portions may help you lose weight and keep it off for at least a year, according to new research. MONDAY, August 23 (Health.com) — Forget diet pills and cleanses. A new study suggests that an effective weight-loss aid is available straight from your kitchen sink. 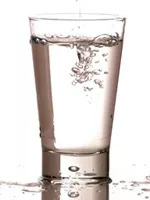 Drinking two 8-ounce glasses of water before breakfast, lunch, and dinner while also cutting back on portions may help you lose weight and keep it off for at least a year, according to research presented today at the annual meeting of the American Chemical Society, in Boston. "As part of a prudent, low-calorie weight-loss diet, adding water may help with weight-loss success," says Brenda Davy, PhD, the lead author of the study and an associate professor of nutrition at Virginia Tech, in Blacksburg. Dietitians have long recommended drinking water as a way to shed pounds, but little research has been done to confirm this conventional wisdom, the researchers say. Though small, Davy's study is the first randomized controlled trial to examine the benefits of "preloading" with water before meals. The study included 48 overweight or obese men and women between the ages of 55 and 75 who were on a low-calorie diet (1,200 calories per day for women and 1,500 calories per day for men). Half of the people were instructed to drink 16 ounces of water—the amount in a small bottle of spring water—before meals. After three months, the participants who drank water had lost an average of about 15.5 pounds, compared to just 11 pounds in the control group, according to the study, the first results of which were published earlier this year in the journal Obesity. Davy and her colleagues aren't sure why drinking water before meals encourages weight loss, but the main reason appears to be that it helps fill your stomach, making you less hungry and less likely to overeat. In addition, drinking more water may discourage you from guzzling soda and other calorie-laden beverages. (The study included only plain water, not mineral, flavored, or vitamin waters.) Even the routine of drinking water before meals may have a beneficial effect because it's a reminder that you're trying to lose weight, the researchers suggest. Drinking more water is a low-risk way to lose excess weight, especially if it takes the place of other liquid calories, says Stephen Cook, MD, an obesity expert at the University of Rochester Medical Center, in N.Y.
"This is an easy way to replace those calories, and if everything is equal, it will slow down your weight gain or reverse it," says Dr. Cook, who was not involved in the new research. "It is one of the safest things we can recommend to help people lose weight." Davy says that people who are trying to lose weight should bring a refillable water bottle to work and drink from it throughout the day. "And try to have two cups of water 20 minutes before each main meal," she says. While each person's hydration needs are different, the Institute of Medicine advises that men and women try to consume about 3.7 and 2.7 liters of water a day, respectively, including water found in food and other beverages. The American Chemical Society is a nonprofit professional organization for scientists that was chartered by Congress in 1937.